Republican Gov. Bruce Rauner (left) will face Democrat J.B. Pritzker in November. With no contested primary races for any of the county’s elected positions, local voter turnout for Tuesday’s Illinois General Primary Election was expectedly light. Republicans ran unopposed in Monroe County for sheriff, county clerk, county board, assessor, treasurer and regional superintendent of schools. Counting early and absentee voting, a total of 4,001 ballots were cast in Monroe County out of 25,313 registered voters, resulting in 15.8 percent turnout for the primary. Contested races affecting Monroe County included Republicans Mike Bost vs. Preston Nelson and Democrats Brendan Kelly vs. David Bequette for Illinois 12th Congressional District U.S. Representative, along with state races for governor and attorney general. With all of the votes in across the 12th District, Bost easily defeated Nelson by receiving 83 percent of the vote. Kelly handily defeated Bequette by receiving 81 percent of the vote. This sets up a Bost vs. Kelly showdown in November. Monroe County voters also selected Bost and Kelly, with Bost earning 84 percent of the vote and Kelly earning 64 percent of the vote over Bequette, who is a Columbia resident. 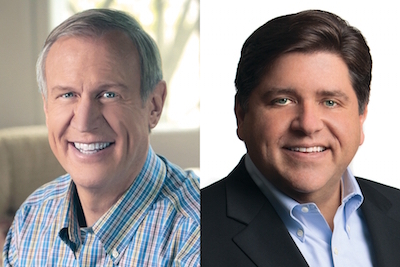 In the race for Illinois governor, it looks like it will be a showdown of billionaire vs. multimillionaire. With 97 percent of all precincts in the state reporting, Democrat J.B. Pritzker leads a six-candidate field with 45 percent of the vote. Daniel Biss is in second at 27 percent. Despite a worthy challenge from Jeanne Ives, Republican Gov. Bruce Rauner leads by a 52-48 count. In Monroe County, voters chose Pritzker at a 62 percent clip with Biss and Chris Kennedy receiving 16 percent of the vote. Rauner topped Ives in Monroe County by a 57-43 margin. In the race for Illinois attorney general, Kwame Raoul leads in the Democratic primary over former governor Pat Quinn by a 30-27 count with 97 percent of precincts reporting. Monroe County voters easily chose Quinn at 57 percent to lead the eight-candidate field. Erika Harold leads Gary Grasso on the Republican side, 59-41. In Monroe County, Harold earned 54 percent of the vote. Attorney Katherine Ruocco of Swansea won the Republican nomination for the circuit judge vacancy of Jan Fiss in the 20th Judicial Circuit, defeating Marshall Hilmes of Marissa. Ruocco received 10,652 votes to 6,970 for Hilmes in St. Clair, Monroe, Randolph, Perry and Washington counties. Ruocco will face Democrat Heinz Rudolf, an associate judge from St. Clair County, for the judicial seat in November. For the final primary vote totals in Monroe County, click here. While it was smooth sailing for Monroe County Republicans running unopposed for county positions in the primary, there were rumblings Tuesday night that the Democrats may decide to give them a challenge in at least one of the local races this November. The Democrats could still slate candidates for those races where they did not have a primary candidate. Monroe County Clerk Dennis Knobloch said they can do so anytime after their county party convention, which is scheduled for April 18. The deadline for filing is June 4. The filing period for Independent candidates is June 18-25. The requirements are a bit more stringent, as they would have to gather at least 974 signatures to be listed as a candidate on the November ballot.